I saw Stan Lee almost die on an escalator–some guy got his messenger bag tangled up in the railing and almost took out everyone behind him, with Stan being the first in line. After the crowd helped Stan clear the obstacle and get to his feet, he blurted, “What was that? !” in his Stan Lee voice. Surreal. I saw Riker and La Forge walking the convention floor, without security and unharassed by the nerdy masses. What has transpired in the world of geekdom that these demigods can traverse freely? Should not these heroes be lavished with geeky worship? Hast thou forgotten Gargoyles? Reading Rainbow? To say nothing of ST:TNG?!? For shame, ye ungrateful dorks. Thou hast forsaken thou nerdy roots! Repent! Repent, lest repeats of classic sci-fi shows be replaced by blighted, hateful sports highlights! REPENT! Whilst working the booth for the day job, a kid ran up, saw the comics and exclaimed, “grab everything in sight!” Thankfully, his mother was accquainted with the modern system of exchanging goods for money, and restrained him immediately. Lastly, I discovered that nerdy Asian guys with mohawks are a dime a dozen at Comic-Con. In aisles crowded with cosplayers, action figure collectors, fanfic writers, and miscellaneous dweebs, I would encounter my dopplegangers… each time we would lock gazes, and time seemed to stand still. Sizing up each other’s mohawks, a hypothetical battle would be waged in the deadly electric path betwixt our steely eyes. In another time and place, under different circumstances we might have been friends, but here and now, we were fated to be enemies. There would be no conflict yet–the pact of the immortal mohawk forbade endangering the lives of mortal nerds. But soon… soon, our destinies would be fulfilled, for there can be only one. Sorry, sometimes I lose my damn mind. Comic-Con will do that to you. there can be only one j. ho! I know how you feel. There are tons of fat white girls with their hair braided! At least I got a Hamtaro hat to set myself apart! There’s a part early on in the movie where two guys are sizing each other up, and a black and white sequence ensues showing the battle they imagine having with each other. I like to imagine that’s what Comic-Con was for you. How do you know that they weren’t just people dressed up in J.Ho costumes? jodi: correction jodi–your hamtaro hat sets you apart AND makes you awesome. mark hale: basically, you read my mind. jenn: ha! well… it is a pretty comfortable costume, so i can’t blame ‘em. that’s why i wear it every day! 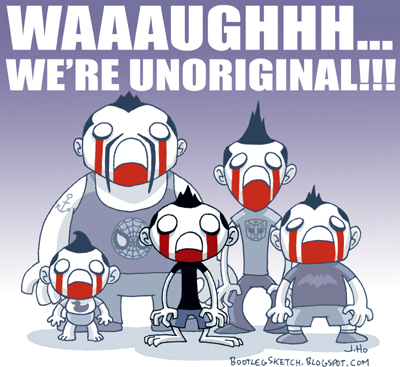 So basically…Asian males with mohawks at ComicCon = male hamsters in a cage.